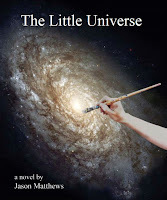 Some recent reviews have come in from review bloggers, authors and readers for The Little Universe. "Not only is the plot based on a brilliant and original concept, it is well crafted, tightly paced and beautifully written"- Charlotte Abel, author of Enchantment. "So different from most other science fiction - this book goes beyond the norm and looks at important Mind/body/Spirit issues in a science fiction setting. Folks wanting the normal kind of shoot-em up with rayguns SF (basically a cowboy yarn in a futuristic setting) will be disappointed. This book has SOMETHING TO SAY. It is not a religious rant. But it does deal with spiritual issues." - Tui Allen, author of Ripple. "The Little Universe is one of those rare books, light enough on the surface to be a fun summer read, but deep enough to keep you thinking about it long after you've turned the last page. The story is absolutely fascinating, one of my new favorite science fiction books." - PT Cruiser, top 50 Amazon Reviewer. Morgan, you're the best! I'm reading Shadow Watchers and really impressed.